Can't spend money now? 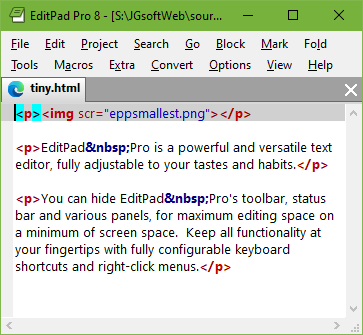 Download your free 30-day trial of EditPad Pro or download EditPad Lite, a basic text editor that is free for non-commercial use. You can make EditPad Pro as small as you like, and hide its toolbar, status bar and side panels. These are just a few from a long list of unsolicited testimonials we have received from our customers. "I have only a handful of essential, excellent, and reliable programs on my computer. EditPad Pro is one of them. I could not function without it, or at least I don't want to consider the possibility." "Frankly, I don't remember how I have been using EditPad—the oldest receipt I can find is 2007, but I think likely the free version before that. I use it every day and now even have converts at the day job. Thanks for a great product and your fantastic support." "Thank you for Edit Pad Pro. I was skeptical of your testimonials until I tried it. It's wonderful." "Thank you. I ran across your editor [EditPad Pro] the other day. I had last used the free version [EditPad Lite] on a couple years back. I own TextPad and UltraEdit too, but I must say yours has leap frogged them. I especially like the syntax highlighting and the download method of getting the highlighting files you want - light years ahead of the other editors."